The MAX98357A is an I2S amplifier - it does not use analog inputs, it only has digital audio input support! Don't confuse I2S with I2C, I2S is a sound protocol whereas I2C is for small amounts of data. This amplifier is designed to drive moving coil loudpeakers only. 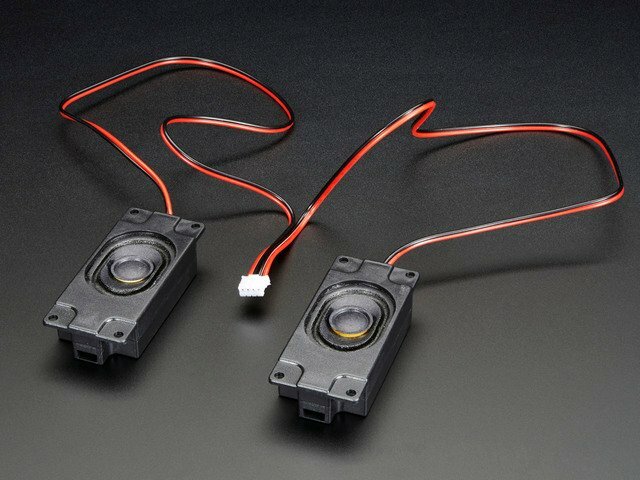 Speaker impedence must be 4Ω or more. The output signal is a 330KHz PWM square wave with a duty cycle proportional to the audio signal. 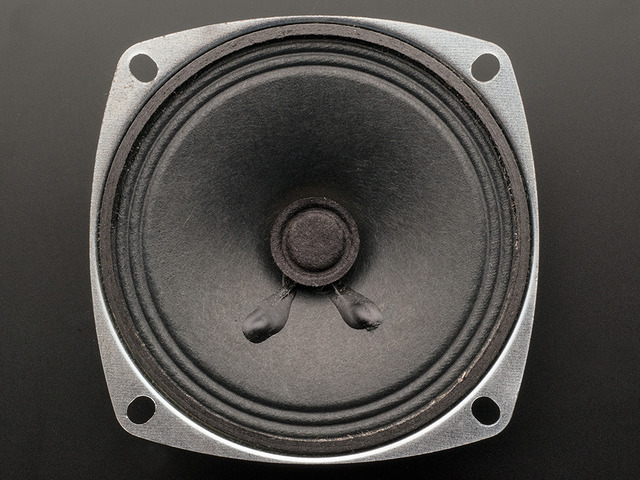 The inductance of the speaker coil serves as a low-pass filter to average out the high-frequency components. Do not try to use this as a pre-amplifier. The outputs of each channel are "Bridge-Tied" with no connection to ground. This means that for each channels, the + and - alternate polarity to create a single channel amplifier with twice the available power. If you have a 3.3V logic device, you can still power the amp from 5V, and that's recommended to get the most power output! BCLK (Bit Clock) - This is the pin that tells the amplifier when to read data on the data pin. Note that this amplifier does not require an MCLK pin, if you have an MCLK output, you can leave it disconnected! GAIN is, well, the gain setting. You can have a gain of 3dB, 6dB, 9dB, 12dB or 15dB. This way, the default gain is 9dB but you can easily change it by tweaking the connection to the GAIN pin. Note you may need to perform a power reset to adjust the gain. If the voltage on SD is between 0.16V and 0.77V then the output is (Left + Right)/2, that is the stereo average. If the voltage on SD is higher than 1.4V then the output is the Left channel. This is compounded by an internal 100K pulldown resistor on SD so you need to use a pullup resistor on SD to balance out the 100K internal pulldown. But the newer ATSAMD21-based boards like the Zero, Metro M0, Feather M0 can! (Note, Gemma M0 & Trinket M0 do not have I2S pins available). And so can the even newer ATSAMD51-based boards like the Metro M4 and Feather M4. To use I2S with M0 or M4 boards, you'll need to install the Adafruit Zero I2S library. It is available through the Library Manager. You can search for (see below) and then just click the install button. Wiring connections are the same as those used for CircuitPython. So go to the CircuitPython Wiring & Test page to see how to wire the breakout for your specific board. The basic test above created the output directly by using the i2s.write() function in a loop. Another approach is to use DMA to generate the output. With this approach, you do some initial setup to configure the DMA engine for playback. It can then take care of generating the output in the background allowing you to do other things in your code. true,                             // increment source addr? 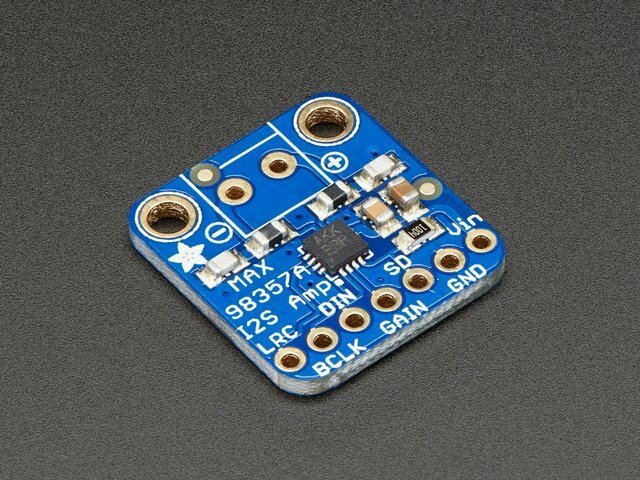 CircuitPython 3.0 and higher has I2S built in which means you can use this breakout super easily with the supported M0 and M4 Express CircuitPython boards! Supported boards are Feather M0 Express, Feather M4 Express, Metro M0 Express, Metro M4 Express, and ItsyBitsy M0 Express. The M0 boards have multiple I2S pin combinations available. We're going to demonstrate a single pin combination for each board. The following wiring diagrams show how to connect the MAX98357 breakout to your CircuitPython board. You'll be using voltage in, ground, bit clock, left/right clock and data pins. VIN is the red wire. GND is the black wire. 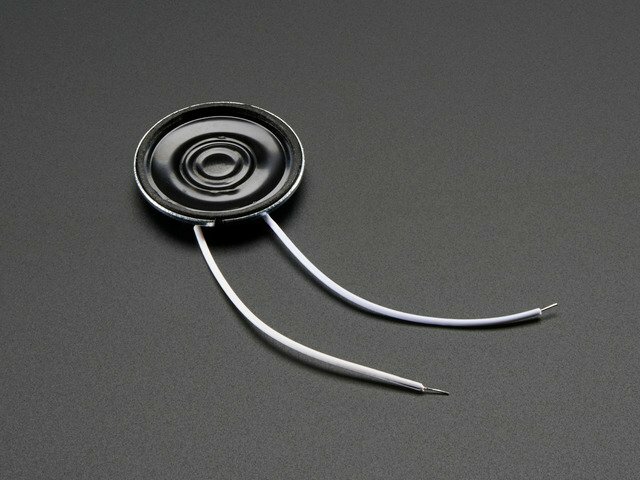 BCLK is the blue wire. LRC is the yellow wire. 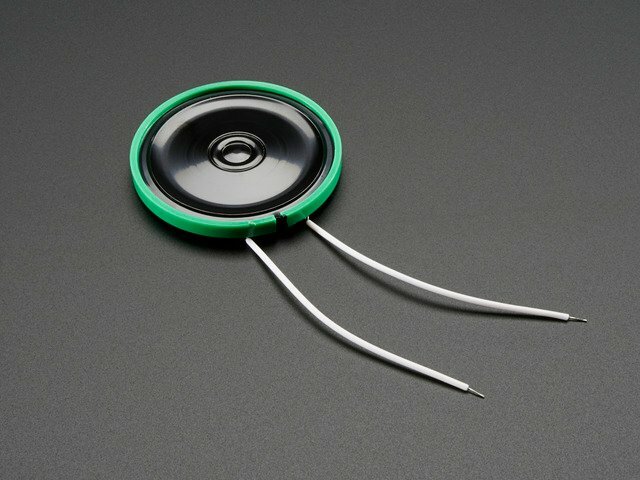 DIN is the green wire. Connect VIN on the breakout to 3V/3.3 on the board. Connect GND on the breakout to G/GND on the board. Connect BCLK on the breakout to D1/TX on the board. Connect LRC on the breakout to D0/RX on the board. Connect DIN on the breakout to D9 on the board. Connect VIN on the breakout to 3V on the board. Connect GND on the breakout to Gnd on the board. Connect BCLK on the breakout to TX on the board. Connect LRC on the breakout to D10 on the board. Connect DIN on the breakout to D11 on the board. Connect VIN on the breakout to 3.3 on the board. Connect BCLK on the breakout to D3 on the board. Connect LRC on the breakout to D9 on the board. Connect DIN on the breakout to D8 on the board. We have two CircuitPython code examples. The first plays a generated tone through the speaker on the breakout. The second plays a wave file. Let's take a look! The first example generates one period of a sine wave and then loops it to generate a tone. You can change the volume and the Hz of the tone by changing the associated variables. Inside the loop, we play the tone for one second and stop it for one second. 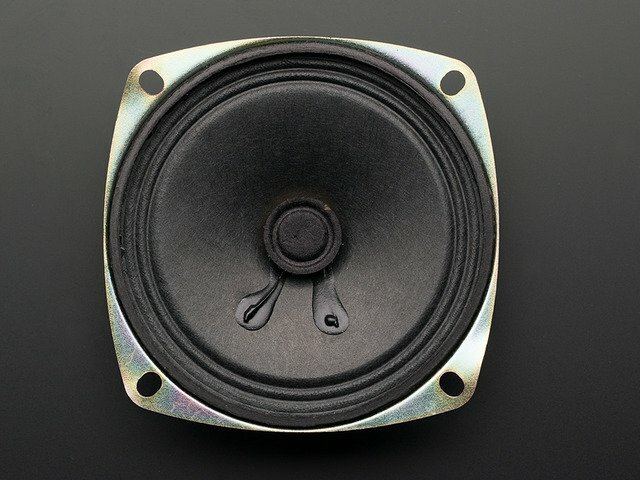 tone_volume = .1  # Increase or decrease this to adjust the volume of the tone. frequency = 440  # Set this to the Hz of the tone you want to generate. For Feather M0 Express, ItsyBitsy M0 Express and Metro M0 Express, no changes are needed for the code to work. For Feather M4 Express, comment out audio = audiobusio.I2SOut(board.D1, board.D0, board.D9) and uncomment # audio = audiobusio.I2SOut(board.D1, board.D10, board.D11). For Metro M4 Express, comment out audio = audiobusio.I2SOut(board.D1, board.D0, board.D9) and uncomment # audio = audiobusio.I2SOut(board.D3, board.D3, board.D8). Now you'll hear one second of a 440Hz tone, and one second of silence. You can try changing the Hz of the tone to produce different tones. Try changing the number of seconds in time.sleep() to produce longer or shorter tones. The second example plays a wave file. We open the file in a readable format. Then inside the loop, we play the file and tell the code to continue playing the file until it's completed. You can use any supported wave file. We've included the wave file used in the code. The object setup in the code is the same as above. Now you'll hear the wave file play through and loop. There's plenty you can do with this example. Try playing a different wave file, or, instead of including while audio.playing: pass, include a time.sleep() to have it play for a specified number of seconds. Check out the Audio Out page in the CircuitPython Essentials guide for pause and resume features. We mentioned earlier that the supported M0 boards have multiple I2S pin combinations available to you. The M4 boards have one option. Either way, if you'd like to know what options are available to you, copy the following code into your code.py, connect to the serial console, and check out the output. These are the results from the ItsyBitsy M0 Express. This guide was first published on May 23, 2016. It was last updated on May 23, 2016.